Rock Ford welcomes bus tours, church groups, and other organizations who wish to reserve a group tour of General Hand's home. Reserved group tours may be booked year-round between the hours of 10 am and 3 pm, with the last tour beginning at 3 pm. The scheduling of group tours at times other than those listed above will be at the discretion of the Group Tour Coordinator. A Rock Ford tour guide will board your coach or address your group on the piazza of the mansion and give a 10-15 minute introduction on General Edward Hand and the history of Rock Ford. Your group will then have approximately 30 minutes for a self-guided tour of the mansion and to explore the grounds. Our tour guides will be stationed on each floor of the mansion to answer any questions, and the Museum Shop will be open. This tour option is for groups of 10 to 20 visitors. A Rock Ford tour guide will give our regular guided tour of the mansion presenting more comprehensive information on General Edward Hand and the history of Rock Ford. This tour is approximately 50 minutes in length, and your group will have a brief time in the Museum Shop at the end of the tour. 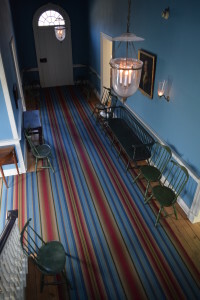 Due to space considerations in the mansion rooms, if a group has more than 15 guests, we recommend dividing into two separate groups, with one group beginning the tour on the first floor and the other beginning on the second floor. Please note that there are stairs in the Rock Ford mansion. The first floor and lower level are wheelchair accessible. The Rock Ford Museum shop is located on the lower level. The Rock Ford mansion does not have any restrooms in areas accessible by the public. However, there is a portable sanitation unit in our parking lot from April through October. This unit is cleaned and serviced on a weekly basis. This unit is available for use by visitors to Rock Ford. However, if your group does not want to use this portable unit, we strongly encourage you to schedule a restroom stop prior to your visit. To schedule a group tour, please contact the Group Tour Coordinator at office@rockfordplantation.org or call 717-392-7223 (Monday through Friday). BRING ROCK FORD TO YOU! A Rock Ford tour guide will travel to your site and give a presentation on Rock Ford Plantation and the life and times of General Edward Hand. This option is perfect for groups that cannot travel or as a special treat for your gathering. Approximately 10-mile radius for mileage (farther mileage subject to .54 cents a mile). Date and time request subject to tour guide availability.